I am starting each month with 10 custom order spots available. If you wish to claim one of those spots, please send me a PM on Facebook, or get in touch via email. Depending on my health and productivity toward the middle of the month, I may make another 5 spots available. Your name will go on the list as soon as you express interest in an impending order; you must pay for your order or make a 25% down payment within 48 hours of your slot being held for you, with a $10 minimum. If you make a deposit rather than payment in full, the balance must be paid within 7 days unless you get in touch with me and make other arrangements. Deposits are non-refundable; if an order is unpaid after 7 days or a time frame we’ve agreed upon, you will lose your spot and your deposit. To be clear, making an inquiry as to a price range or supplies available does not mean that you’re committing to an order! Please make general inquiries without feeling any obligation. 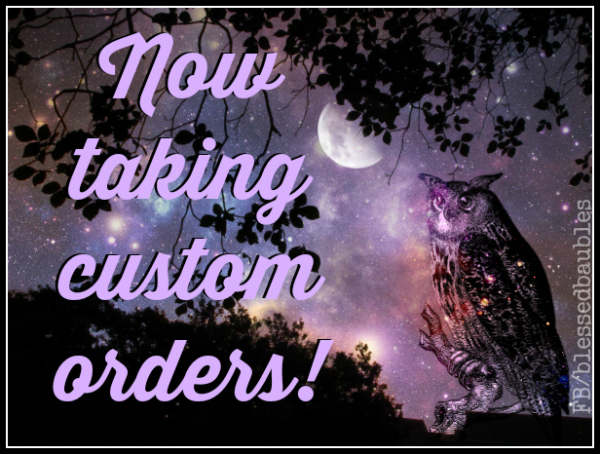 Once custom orders are paid for, there is generally a 4-12 week turnaround time because I usually have a list of orders waiting and place most of my supply orders monthly. Acute illness or supplies being backordered may also cause delays. Please keep this in mind when ordering custom jewelry. If you have a deadline, please make me aware of it when we discuss your piece and before you pay for your order. These are the only circumstances under which I am able to promise a specific shipment date. Please complete checkout promptly once we’ve come to an agreement and your listing is ready. Unless we’ve made other arrangements, payment is expected within 24 hours. I find that most people who express interest in making an immediate purchase of a custom listing and then don’t follow through within this time frame — and aren’t communicative about something causing a delay — generally don’t return to make the purchase, so it is my policy to not leave unpaid custom listings or invoices lingering indefinitely. I require a $10 consultation fee when discussing fully custom orders, to ensure that I am not wasting my time; any such consultation fee will be applied in full to the cost of the custom order if and when the order is placed. Should you pay a consultation fee and decide not to place an order at that time, the fee is non-refundable unless you return to order the piece we’ve already discussed within 30 days. If you wish to discuss a completely different custom piece, even within the same 30 days, a separate consultation fee will be required. I may waive this fee for repeat customers in good standing, at my discretion. Please be prepared to clearly communicate to me exactly what you’re looking for before we begin discussing your order. If you can’t tell me what you want — whether there are particular colors, materials or energetic intentions you have in mind, or even if you just want me to be creative and make something with you in mind — there are simply too many options available for me to figure out what you’re looking for and offer it to you in the time I charge for when providing estimates for custom work. If you’re not ready to tell me what you want, I suggest looking through my photos for something that grabs you. I can make a piece with a similar design or energetic feel. Please let me know if you have any questions. Thanks so much for your interest! Could I custom order a piece that I could wear in the water? I’m afraid that I can’t recommend prolonged wear/submersion in water for my pieces. While some pieces may in fact be completely fine with wear in water, I am not comfortable recommending it at this time and emphatically warn against it in many cases. Thanks so much for your interest!